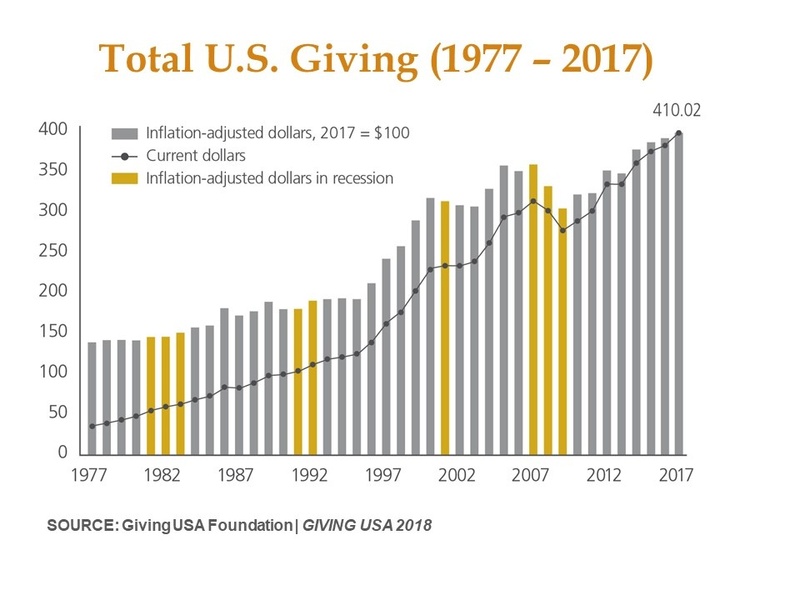 Giving USA released its annual estimates of U.S. charitable giving today, and the results show impressive growth despite a shifting national landscape. Giving USA 2018: The Annual Report on Philanthropy for the Year 2017 reports that total charitable giving in our nation reached $410.02 billion in 2017, an increase of 5.2 percent over 2016. This total breaks the lofty $400 billion mark and is the highest in the history of Giving USA, which began tracking this data more than 40 years ago. Published by Giving USA Foundation, a public service initiative of The Giving Institute, Giving USA is the longest running and most comprehensive report of its kind in America. It is researched and created by the Indiana University Lilly Family School of Philanthropy. All but one of the nine major categories of charitable organizations realized growth in giving. (International affairs saw a decrease of 4.4%.) Amid new national leadership, numerous national disasters, and the uncertain impact of tax law changes in December, Americans gave. This positive growth trend was fueled by a strong economy and an increase in personal consumption (4.5%)—the strongest indicator of individual giving. “Why don’t we give money to the Church any more, mom?,” was the question from my then ten-year-old son one Sunday morning. I realized that he had stopped seeing my husband and me put the envelope in the collection basket, as we had done for as long as he could remember. Well, of course we had not stopped giving to our Church but rather had moved to a more convenient and consistent method of giving that was encouraged by our parish…. online giving. Online giving ensures a weekly collection regardless of travel or forgetting the envelope at home, yet it takes away a very important symbol of giving: the physical habit of placing the envelope in the basket for all to see. Increased life expectancy, better healthcare, and delayed retirement all contribute to this unprecedented generational diversity. Why should development professionals pay attention to generational diversity in the philanthropic marketplace? Each generation is influenced by their own economic, social, political, and environmental dynamics as well as collective experiences and different worldviews. These factors inform philanthropic behavior and generational giving preferences and have implications on how we as development professionals build relationships with donors. Major gift donors are crucial for the ongoing sustainability of your nonprofit’s mission. 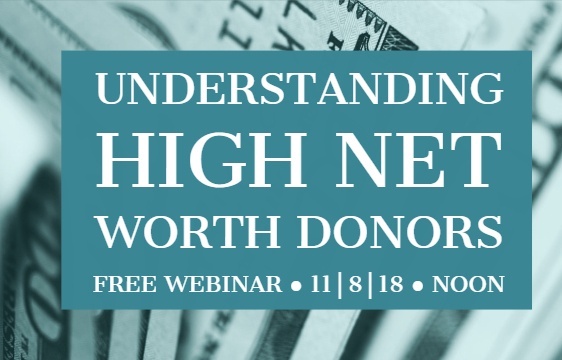 In fact, high net worth donors often provide as much as 94% of the funds for nonprofit campaign initiatives. So, it is important that we understand their giving patterns, preferences, and motivations. 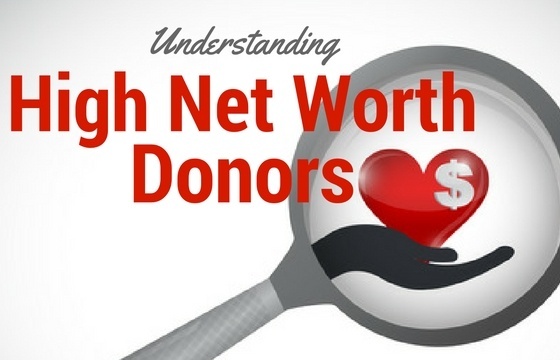 The 2016 U.S. Trust® Study of High Net Worth Philanthropy released this week is the sixth edition of the biennial study, researched by the Indiana University Lilly Family School of Philanthropy and provides nonprofits with valuable insights on this important donor demographic. The report surveyed 1,435 U.S. households with a net worth of $1 million or more (excluding the value of their primary home) and/or an annual household income of $200,000 or more. 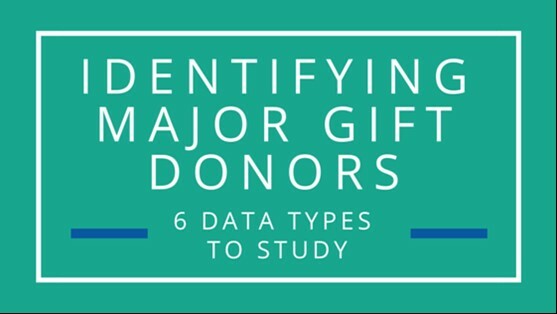 Looking for strategies to identify major gift donors? We’ve asked Bill Tedesco with DonorSearch to provide some insights and he shares that prospect research is a great place to start. 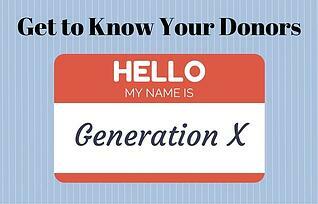 The Baby Boomer and Millennial generations are frequently top of mind in discussions and research into the generations and generational giving preferences, but what about the “in-betweens?” Given the buzz, particularly about Millennials, it may be easy to overlook a resource for significant current and future donor growth for your organization: Generation X. Also known as Gen X, this group includes those born in the United States from 1964 to 1980. 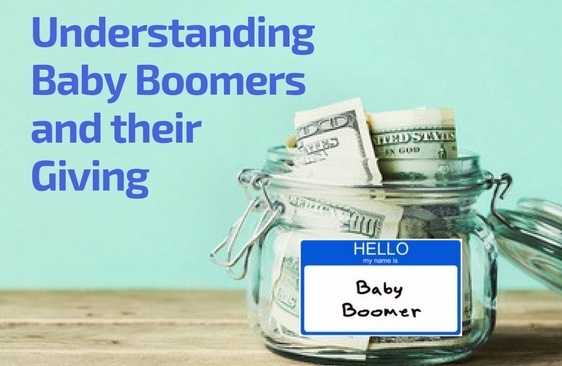 Gen Xers are sandwiched squarely between older Baby Boomers and younger Millennials and represented 20% of total giving in the U.S. in 2013.